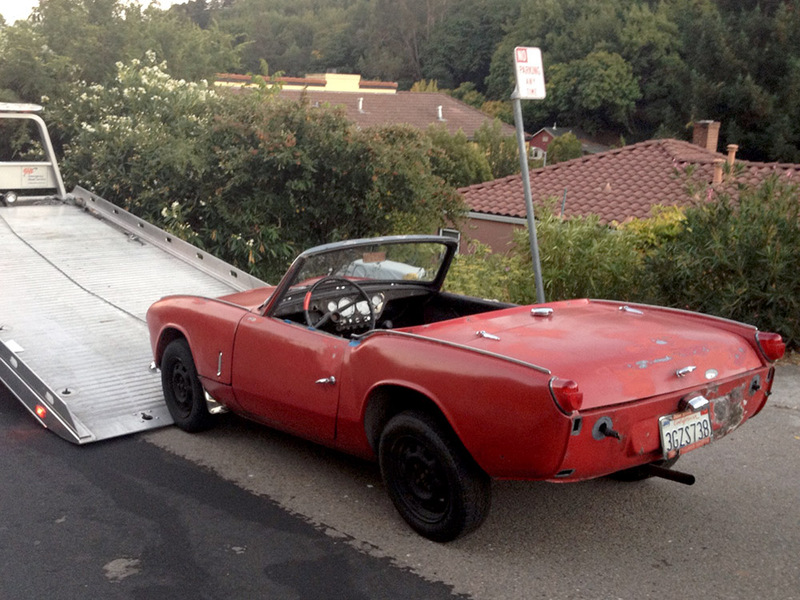 Grandpa Stan bought this 1962 Triumph Spitfire and has been restoring it. It had two brackets that hold the stabilizer bars, but his were horribly bent and broken. I guess those brackets are hard to get because he asked me if I could make some replacements. He gave me the the less destroyed of the two plates. I was able to get some rough measurements. 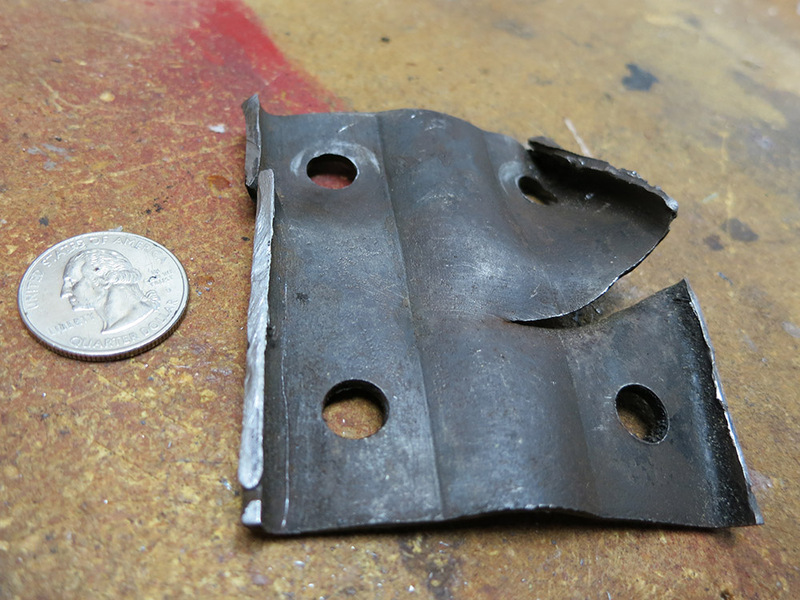 I had sheet of metal with the same thickness, so the first thing I tried was cutting a piece out with the bandsaw and bending it into shape cold. I used the vice and a big hammer to incrementally bend the center channel. I clamped the metal in, hit it a few times, moved it up in the vice a little, and hit it some more to continue the bend. 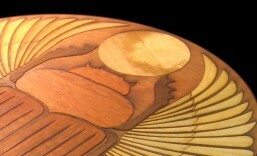 Then I bent back either side of the channel to form the transition from center curve to flat. Finally I bent up the two edge wings. I had left plenty of extra metal for the wings to give me leverage. This cold bending system was simple, but the results were poor. The positioning was not super accurate. The curved channel’s shape got distorted when I bent back on either side to make the transitions, which were not all that crisp. I had to admit I wasn’t going to be able to bend it cold. The reason I’d been trying to avoid working it hot was that the plates were just a little too wide to fit into my super tiny forge. That meant that I’d need to haul out my foundry furnace and burn 45 minutes worth of propane just to get the furnace up to temp. I guess I could have used to OA torch with a rosebud tip to do the heating, but then there would be one more thing to juggle around, and I don’t have five hands. 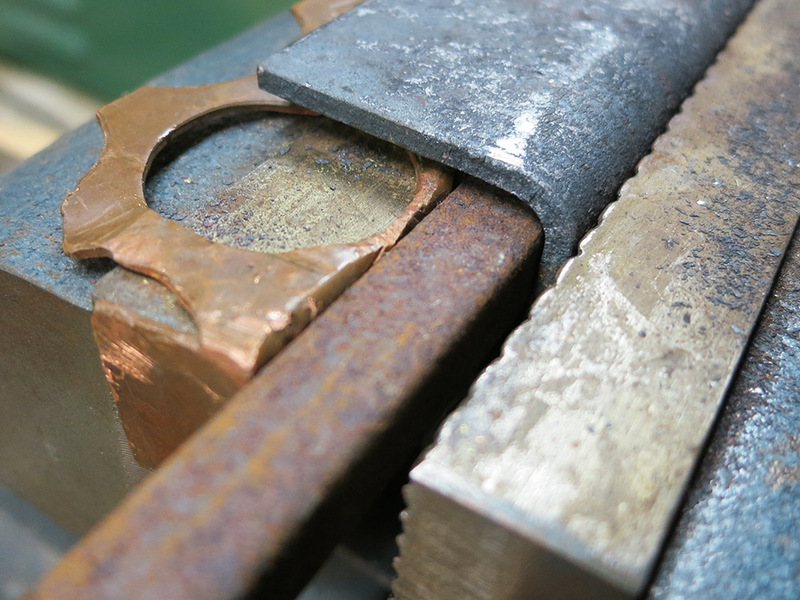 Some metal-working friends suggested forming the pesky center channel curve by placing a vice set to the correct width underneath the hot metal, having a heavy bar (with the correct radius) on top, and hammering down the bar to force the metal into shape. 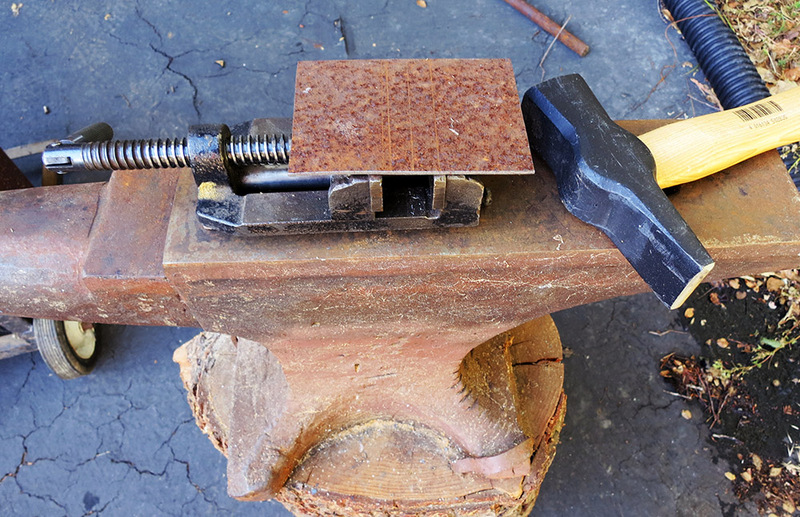 I put my drill press vice on the anvil and set its jaws to the spacing I needed. Some hunting though the scrap pile under the house turned up a solid bar that was close to the right radius. I had a pipe that was the exact radius, but I thought that might not be able to take the hammering without going out-of-round. It seemed better to use the solid bar. Here’s the plate on the vice, and you can see the metal bar in the background. I put the vice on the anvil so it would be able to take some pounding. 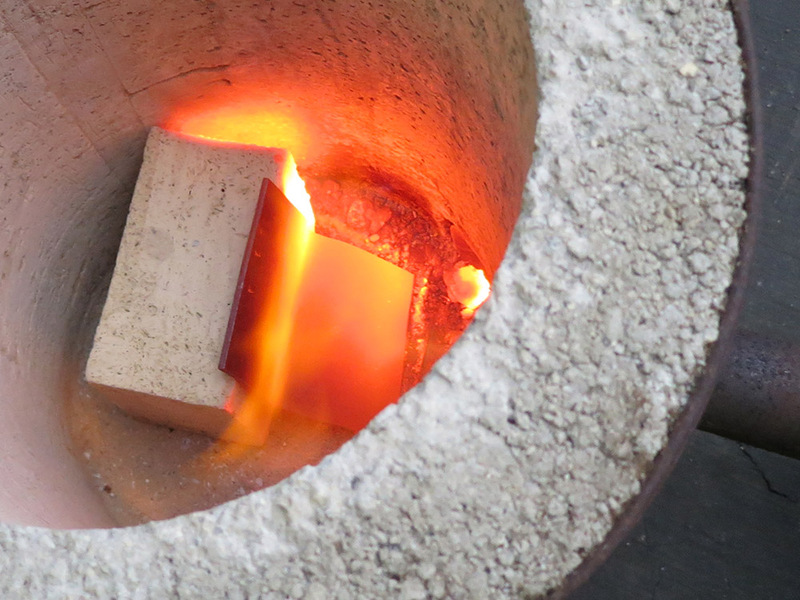 The plan was to heat the plate in the furnace, fish it out with tongs, and position it on the vice. My wife would then place the rod into position, and I’d hammer it down. We practiced it cold, and then gave it a try. We were a bit slow, so I ended up having to do 2 heats to form the channel, and then another heat to fine tune the transition back to flat. We banged channels into two of the plates, and it was time to put all this stuff away. At least we put on an interesting show for the kiddos. It was kind of a big production for two little curves. That was it for the hot work. The next day I scribed, center punched, and drilled the holes on the drill press. Simon came out to help, so I let him stand on a stool and turn the drill press on for each hole. 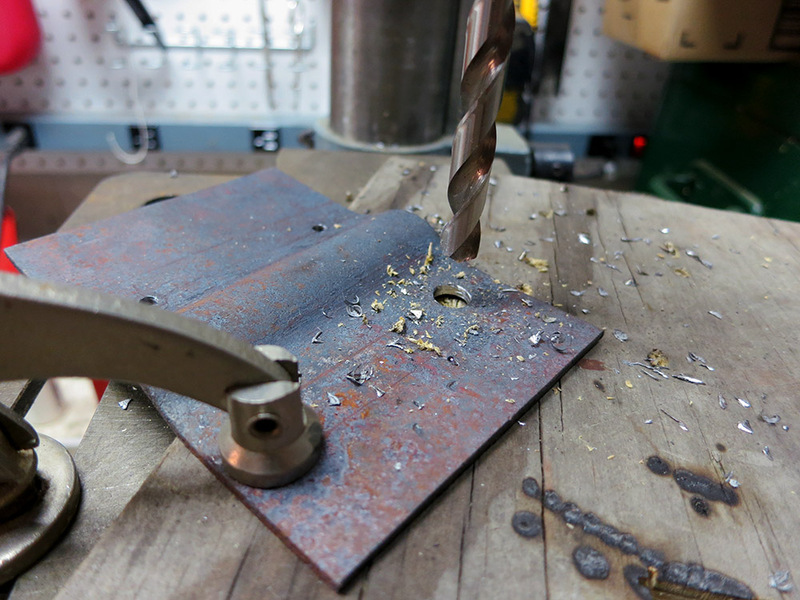 We talked about drill press safety, like how it’s good to clamp the work down. We also discussed how to position the piece so if the bit catches, the part spins into something solid that is not the operator. He did a good job helping. I like his safety gear. We have strict rules about “no bare feet in the shop,” but I guess Tigger feet are all right. 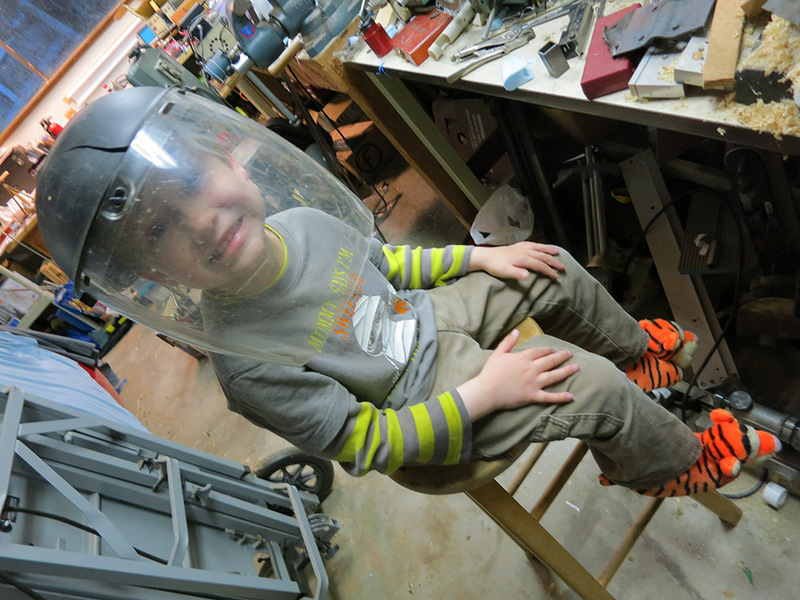 I love that those Harbor Freight face shields adjust down small enough for his head. 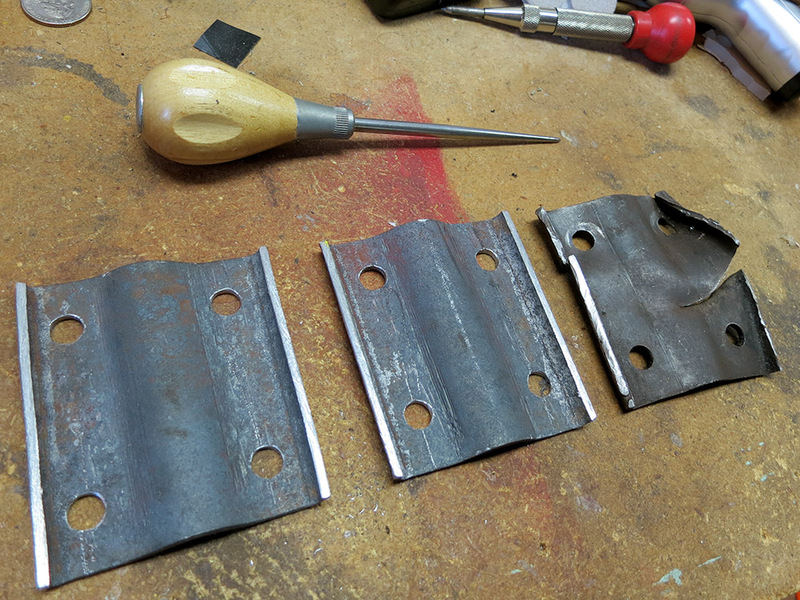 Once we had all eight holes drilled, it was time to bend up the wings at the edges. I just did that cold in the vice. One tricky part was that in order to not squash the center channel area, I had to extend the jaws of the vice a bit with some square stock. This part is where Simon helped a lot. 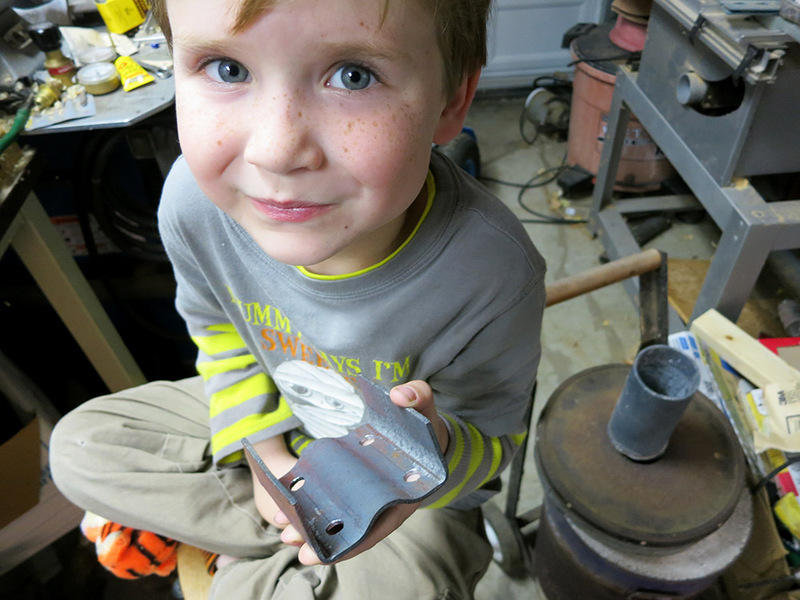 I was able to align the square stock and the part in the vice, and then tell Simon to crank the whole thing tight. There was certain amount of “No the other way!” but it really was something that would have been a pain to do on my own. Then all I had to do was mark and hacksaw off the long extra parts of the wings. The channel in the middle made it impossible to cut the excess off with the bandsaw. 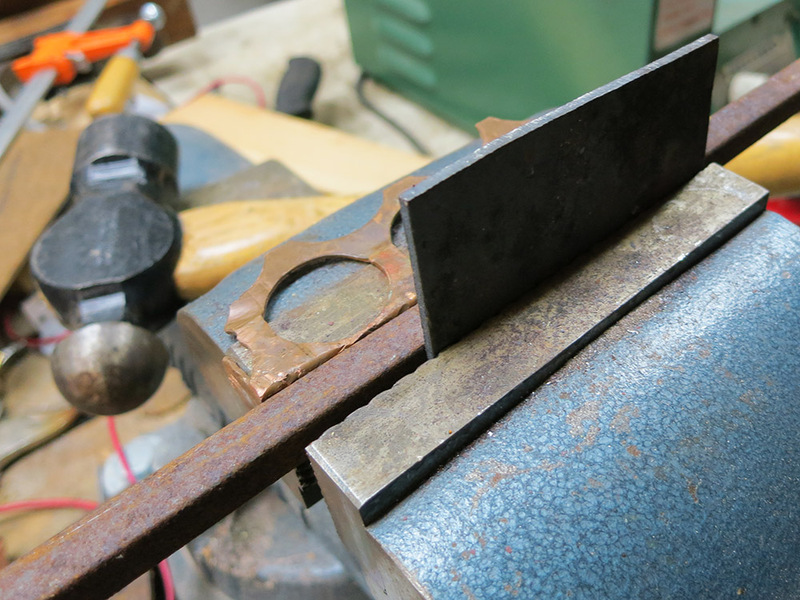 A nice sharp hacksaw can work wonders even if you do end up sweating a bit for the results. Here they are after being cut and cleaned up with a file. I think they came out fine. They’re hand made, so they’re not crazy precise. Hopefully they’ll be good enough. It’s time to sand blast them, clean them up, and mail them off to Grandpa. This entry was posted in Build Details and tagged Bracket, DIY, Forge, Spitfire, Triumph. Bookmark the permalink.